1.1 What is a chayotera like? 1.7 Is chayote plant good for animals? Chayoteras are perennial vines that come from tropical America. The ancient Aztecs knew it as hitzayotli, meaning “spiny squash, but the word derives from the Aztec chayotl (=chayote). What is a chayotera like? The most used chayotera is the Sechium edule, or spiny squash, because some varieties of fruits have spines. This chayotera is characterized by its slender stems, creeping or climbing up to 10 m in length. It is also know under the names of christophine, cho-cho, choko, pipinola, pear squash, vegetable pear. Other names are: chinchayote or chayotextle in Mexico; ichintal or güisquil in Guatemala and Venezuela. Chayote leaves show from 3 to 5 lobes and can reach 20 cm, with serrated edges and with a dense sticky pilosity. Its flowers are unisexual, Male ones pale yellow in racemose inflorescences, while female flowers are greenish. They meet in inflorescence stems at the end of the axiliary stems. Chayote fruits grow solitary or in pairs and appear in summer. Large pear shaped. Its skin is pale green, bright, spacious with ribs and some thorns. There are varieties yellow, or dark green fruits. These latter are characterized by the presence of numerous spines. The flesh can be white or pale green. The wild species have a bitter taste. The fruit has inside a single seed, flattened and smooth surrounded by a fibrous cap. Difference in size: Wild species are bigger and stronger in general. Difference in germination: Wild fruits only germinate when they rot on the ground, while cultivated fruits germinate before they are rot, even on the same tree or after cutting, if not in a cold environment. Difference in blooming and fructification time: Species cultivated in warm climates bloom in spring and produce fruit in summer, while wild species blooming takes place from spring to early winter and produce fruit from late summer to early winter. No one knows exactly when cultivation of chayote began. It seems that it was grown widely in Mexico and Central America by the Aztecs and Maya before the Spanish colonizers arrived to America. In the eighteenth and nineteenth centuries, the Spanish introduced it in Costa Rica and took it to Europe, from where it spread to Asia and Africa. In the late nineteenth century, it was exported to the United States. The general opinion is to place their first crops from southern Mexico to Guatemala. Photo of chayotes in a market. Thorns on the skin are appreciated. – In Mexico: chayote, Huasquila, Shamu and many names. 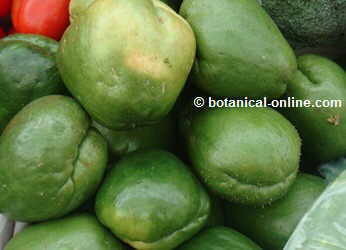 – In Colombia: chayote, potato or potato cider poor. – In Bolivia: Japanese pumpkin. – In the West Indies: chayote, tayote. chocho or Mirliton. Sechium hintonii: natural from the state of Chiapas, Mexico and neighboring areas of Guatemala. It’s a species of very arid areas. Sechium tacaco: Grown in Costa Rica. Sechium compositum: Natural from Chiapas in Mexico and northern Guatemala. This species grows in the mountains. It differs from other chayotes for being a fruit that endures and keeps well after being harvested. Is known by the name of “horse Chayote”. Sechium chinantlense: Natural from northern Oaxaca, Mexico, where it is known as “Chayote bush” or “Head of Chango”. 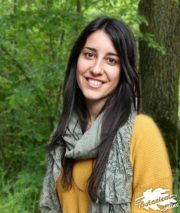 It is a species in danger of extinction. Sechium panamense: It’s kind of squash that grows in the panamese state of Chiriqui over 2000 m altitude. Sechium pittieri: Native of Costa Rica, where it is known with the name “Spook tacaco”, it is one of the favorite foods of the native Guetares, who collect its fruits in September. They also use their tender leaves. This population also uses the Sechium edule which is collected from the forest during the month of October and Sechium tacaco during September. Other species of chayotes are: Sechium talamacense, Sechium venosum or Sechium villosum. Fruits with dark green rind. 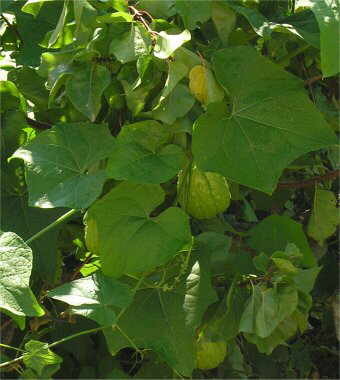 The chayote vine or chayotera is mainly cultivated for its fruits. 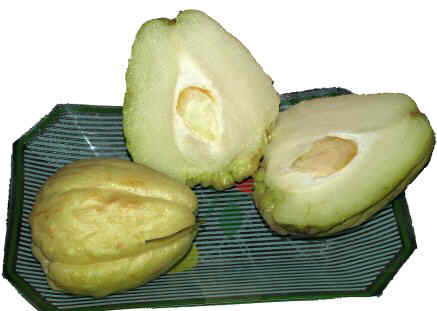 This fruit is used as a vegetable for human consumption. Chayotes are generally eaten boiled, but they are also delicious when fried or in omelettes. The pulp of this fruit is used as a thickener for baby pures. Besides fruits, the tuberous part of the root is eaten in the same way than potatoes (boiled, mashed or in combination with other vegetables) In Mexico they call this part ” camochayote”. The young leaves can be used as a vegetable and even the seeds are edible. Increasingly there is a tendency to produce chayote canned jellies, jams and pickles, to preserve this fruit for much longer. Is chayote plant good for animals? The plant is also used as food for livestock and with the stems baskets or hats are made. In addition to Costa Rica, followed by Guatemala and Mexico, which are the first chayotes producing countries around the world, the Dominican Republic, Brazil and Peru are also producing countries in Latin America. Chayote is also grown, though in smaller quantities, in other parts of the world, such as India and China in Asia and Italy in Europe. In the United States it is grown in warmer southern areas (mainly California and Florida) but most of the chayote consumed in this country comes from exports from American countries, Costa Rica remains the fundamental one. More information on chayote properties and cultivation.